Join us for our Annual Moonlight Pond Tour and After Party. Nature’s Re-Creations has been doing pond tours for many years. It started as a way to showcase our work, but it’s grown into an educational event, as well as a time to appreciate the outdoors. 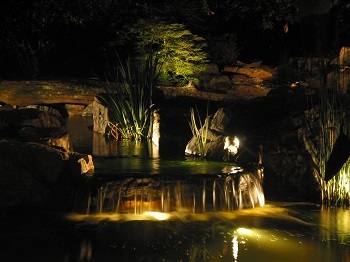 This event is specifically geared towards the evening appearance of our water features. Nighttime is the best time to enjoy a water feature and if you have not seen one of our features lit up at night you are missing out! Local homeowners invite us to see their beautiful home water gardens. The tour is self-guided and a great opportunity to experience some of the area’s most beautiful outdoor retreats at your leisure. You will have the chance to speak to our pond experts to answer any questions that you may have about water features and how you can have your very own water garden in your own backyard. Meet the owners, see how they’ve personalized their water gardens, get inspiration for your own, take pictures and enjoy the scenic area. And, of course, see the remarkable work our crew has done on these outdoor water features. Come experience and enjoy the charming sights and soothing sounds of these beautiful outdoor water environments. You’ll be glad you didn’t miss it! For more information about our pond tours, contact us today at (636) 223-2330.